For many years now, indigenous Hawaiian people have been involved in a battle to stop the construction of a new 30-meter telescope (TMT) array on Mauna Kea mountain, which is a sacred place and the source of all drinking water on the island. The project would be the size of a sports stadium – bigger than all the other telescopes on the mountain combined. But now the construction is going ahead. The bulldozers have been moving over the past two weeks. On March 26th, a series of peaceful protests began. More than 31 people have been arrested so far, and a brief moratorium on construction until April 20th has been placed in effect. This is time for the land defenders to come together and build even more pressure! Donate to this fundraiser which is focused on bail funds, public education, and supplies for people camping on the mountain. Support our friend Anne Keala Kelly, Kanaka Oiwi filmmaker who is making a film about this issue to spread the word and grow the movement. 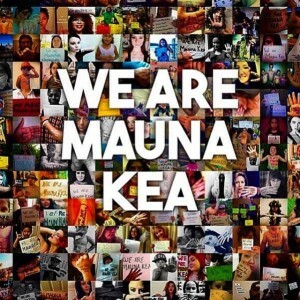 Follow Protect Mauna Kea on Facebook and Twitter, and spread the word online and in your community. Stay tuned for more news and information on this situation. If you live far away, find out about sacred and special places in your area and work to protect them. Get in touch with DGR if you wish to join us in this effort. “Why The Mountain” rough-cut scene with Skippy Ioane. from anne keala kelly on Vimeo. Colonialism & Conquest, Indigenous Autonomy, Obstruction & Occupation Mauna Kea, Native Hawaiians, TMT. permalink.